We assemble the prayer requests from the inmates into a letter form. We send a copy to each person asking for prayer as well as the person being prayed for, plus our prayer warriors. In all, over 200 people receive the prayer letter twice a month and pray for all requests. We have teams of people that come into the ministry to assemble bags that contain ready to eat food items, toothbrush, toothpaste, soap, shampoo, hand sanitizer, deodorant, socks, dicipleship materials, a blanket, hat and gloves when it's cold. Then our team members carry the bags in their car and hand them to homeless people whenever they see them. For information, call Outreach for Christ at 498-4700 or email ofc@outreachforchrist.org. Our staff and volunteers participate in one-on-one evangelism during various hours of the day and night. 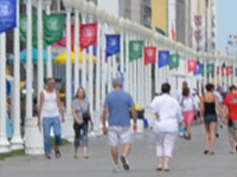 When groups are available, Outreach for Christ supports drama, puppets, and music on the Virginia Beach boardwalk. We are partnering with several churches in the area who have street evangelism ministries and hope to expand our work in this area. Outreach for Christ finds a close correlation between the streets ministry and the jail ministry. 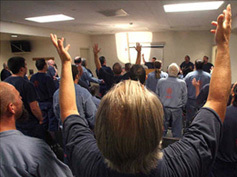 We handle some of the local correctional centers needs, such as counseling and worship services. When possible, we follow-up with the inmates at state prisons with letters and revival services. We have pledged ourselves to assisting a person returning to public-life with their rehabilitation, as much as possible. We utilize our weekly Prayer Letter to minister to the inmates and to their friends and families. Outreach for Christ is unique in that we are one of the only jail and prison ministries that actively seeks to care for the families of the inmates as well as the inmate. We are also currently housing recently released men and women in our ministry house to help aid and assist them into transitioning back into society but also foster spiritual growth. 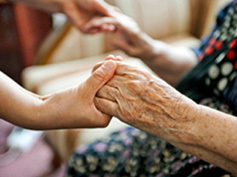 Each Sunday, volunteers minister and witness to the residents of local nursing homes. These residents are given the opportunity of hearing praise songs and a message in their dining hall where many salvations have happened. It is an awesome thing to know that a life has been changed and that it's never to late to be with the Lord for eternity!